This is a Tips & Lessons category for the website. My first patchwork quilt was a Grandmothers Flower Garden design, made with hand block printed fabrics, purchased from local textile markets in India where I was living at the time. Little did I know that that quilt would catapult me into a world of design and color that would affect the rest of my life. More than 30 years ago I purchased an antique quilt made in the early 1800’s. 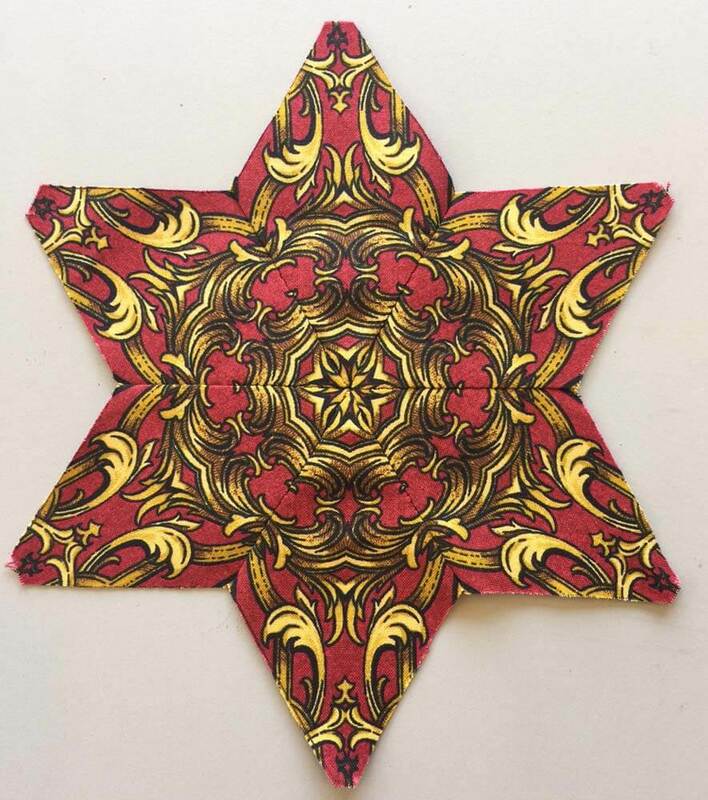 I had already been “fussy cutting” border print fabrics and mirror imaged fabrics to create interesting effects and I was thrilled to see that the maker of that quilt had “fussy cut” motifs in the fabric to center in each hexagon. Border prints with their mirror image motifs can lend another level of interest altogether and give a wide variety of diversity to the design. 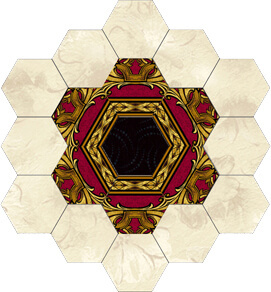 For the best effect, use the ring of hexagons around the central piece. To fussy cut hexagons, mark a mirror line down the middle of the template. Center the mirror line over a mirror-imaged portion of the border print, then draw some portion of the fabric design directly onto the template. This will provide a guide for cutting five more identical pieces for the first ring of hexagons. 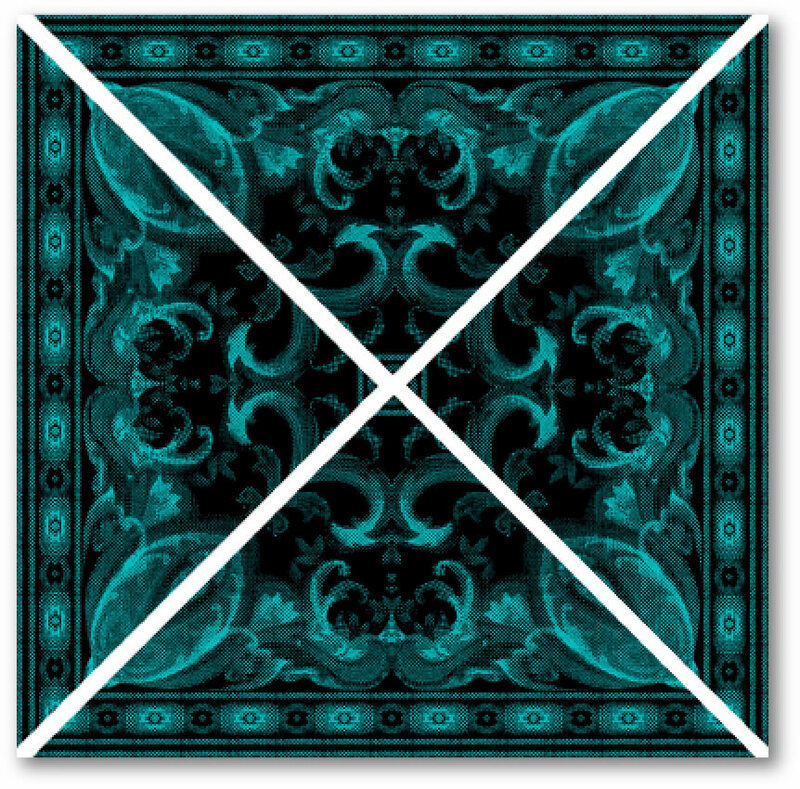 Place the template on on a variety of different mirror motifs in the border print. There will be very little waste when you cut pieces in this way. The challenge is to see how many different designs you can get from just one fabric. 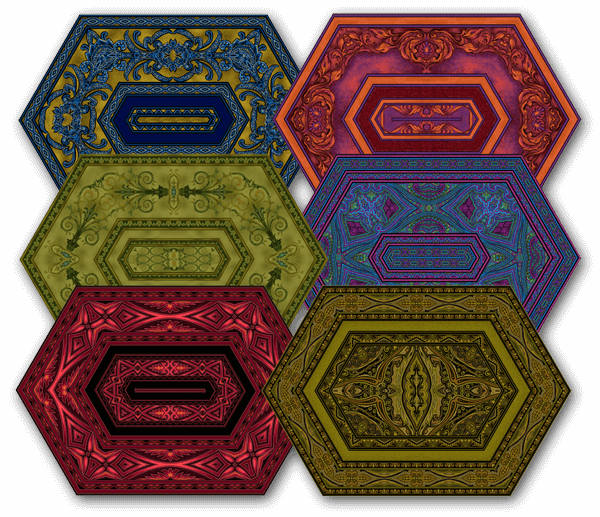 Cutting hexagons in the positions above creates all these different looks. Some of the effects are achieved by simply turning the hexagons upside down. See the examples below: both blocks use the identical patches, but the striped portion is positioned toward the outside of the block in the first example, and the inside of the block in the second. Jinny set her hexagons with a diamond path. These are the shapes she used. Light Background: No Longer Available. Sometimes, however, you need to sew a patch to its mirror-image. Fortunately, that’s easy to do! In the Queen’s Crown block, the illusion of a border print frame is achieved by putting one patch right beside another that is its exact mirror image. If two patches will meet, using one regular and one mirror-image patch will allow the design to seem to reflect naturally around the corner. Mark the design motif on your template and use it to cut the number of regular patches you need. Then, just flip the template over and use it to cut your mirror-image patches, lining up your design motif markings with the matching motifs on your fabric. You can create spectacular effects using this technique in diamond-shaped patches. To create a border print diamond, you need four triangles: two are the same and two are exact mirror images. 1. Divide the diamond in half lengthwise and crosswise. Make a template from one of the four resulting triangles. Add the seam allowance to the outside and an arrow to show the lengthwise grain of fabric. After dividing the diamond, make a template from one of the sections. 2. Position the template onto the fabric and draw a design motif from the fabric onto the template. Cut two identical triangles. These are the regular triangles. 3. Now, flip the template over and align the markings on the template with the fabric grain and the matching design motif on the fabric. Cut two of these triangles. These are the mirror-image (or reversed) triangles. You will have two sets of mirror-image triangles that form an intricate-looking diamond when sewn together. Other geometric shapes can be made with a border print fabric in the same way as a square. The secret is to divide the shape into identical triangles. Create a template for that triangle (be sure to add the seam allowance), then cut as many triangles as you need from identical portions of the border print. For detailed information on using border prints in many ways, download Making Magic with Border Prints Booklet. Another great reference is Tips on Fussy Cutting Patches — another free download! Quilters have been fussy-cutting fabric since the very beginning, and border prints create unique effects when cut carefully to fit in a specific patch.It can be as simple as replacing a single patch in a block or subdividing a large shape and using an identical piece of border print in each of those new pieces. Watch the video to see how much impact you get with this technique and to see Jinny demonstrate how to modify a block to get that border print special effect. Jinny frames most of her quilts with border print stripes. 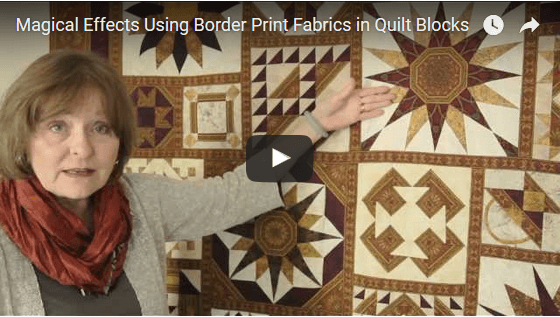 Watch the video to see Jinny step you through her easy, no-math method of adding mitered border print borders to a square or rectangular quilt. And for future reference, download and print the instruction sheet below. My Windows quilt appears to have border print circles in several places. 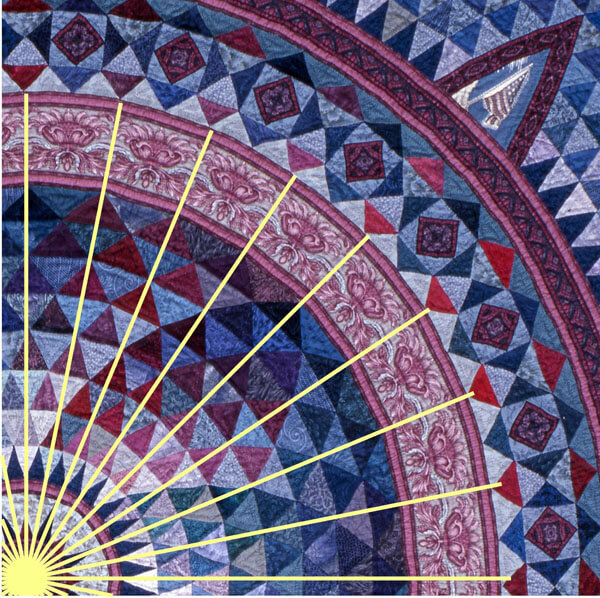 The curves are actually an illusion: the four different circular bands in the quilt are made up of small wedges of fabric that have straight sides. However, by dividing the bands into pieces, you can get the appearance of curves. the quilt center is shown here. Jinny’s Windows quilt, made to honor the victims of the 9/11 attacks. Let’s look at the center of the quilt first. The center block, Liberty’s Crown, appears to be a circle. However, look at the line drawing: the very center “circle” is actually a polygon with 16 sides, and the circular “frame” around it is actually made from 16 wedges. All the sides of the wedges are straight lines, but because the lines are quite short, when the wedges are sewn together, the section appears curved. The frame around the center image appears circular but is actually made from 16 wedges. There are four bands of “curved” border print fabric in the quilt. The smallest band (the one around the center patch with Lady Liberty) is made from 16 wedges; the outermost band is made from 128 wedges! This band in the quilt was divided into 32 sections. One quarter of the quilt center is shown here. Here’s how you can convert a circular band to use this technique. 1. Divide the band into segments. For the example below, I’ve used just eight segments rather than the 32 in the quilt. (The larger the circumference of the band, the more segments you’ll need to maintain the illusion of curves.) Using a computer makes this super-easy, but you can also use a protractor to determine the position of the angled lines. Divide the circle into equal sections. 3. Trace over the wedge to get your finished patch size and add a ¼” seam allowance all around. Make the template, adding the seam allowance to the outside. This technique will work for any fabric, but because I wanted to use border print fabric, there were two more things I had to do. First, I wanted the band to include a printed stripe around the inside and outside of the band because I like the way this frames an element in a quilt. So I needed to make sure that the band in my quilt was the same height as the border print I had selected. After drawing the straight line between two angles on the inside circle of my band, I drew the second line the width of the border print (4 ½”) above the first. After adding the seam allowance around the edges, my template was the perfect size for cutting the border print. The height of the wedge should match the width of the border print stripe plus seam allowances. The template is used to cut identical wedges from the border print fabric. Creating curves with border print fabric isn’t something you can accomplish “lickety-split”, but it also isn’t as hard as it might seem. It just takes some time and patience. For even more information, see my book, Quiltmaking by Hand, pages 139-141 and 154-155. 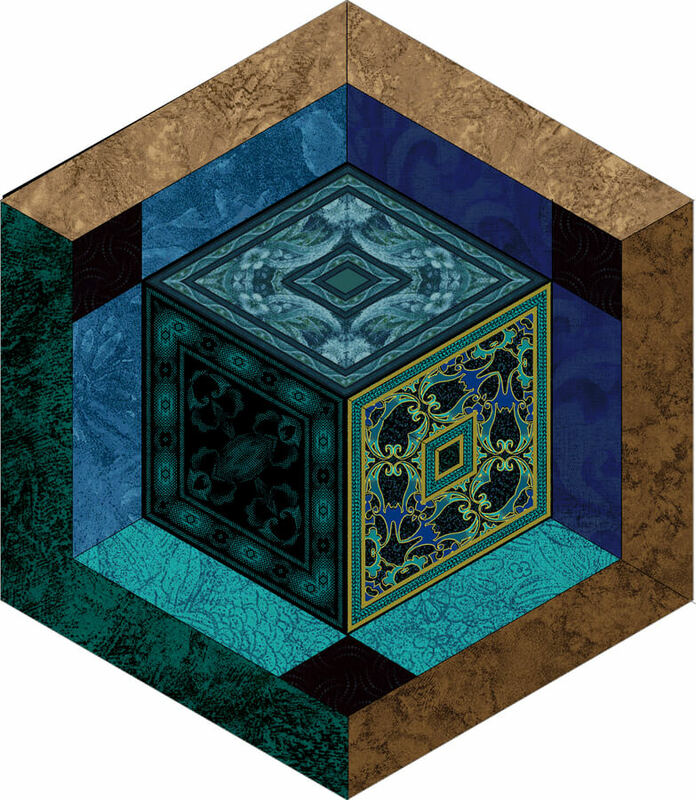 To create kaleidoscopic effects in patchwork blocks, each of the fabric patches must have identical designs. However, even though you work really hard to cut the pieces exactly the same they do not always match. Because fabric can stretch during printing or cutting, even though the mirror line on the template runs exactly down the middle of the mirror line on the fabric, it is possible that the opposite sides of the patch will not have exactly the same motif as the left side. Sometimes it is off by as much as an eighth of an inch. So how to get that perfect kaleidoscopic effect? Simple! When pinning the pieces for sewing, line up the design printed on the fabric, not the edges of the patches. If one of the pieces is off by an eighth of an inch, then the other side will be off by the same when you sew the other side. These off-set pieces will even each other out and the designs will line up perfectly. As indicated by the arrows, the fabric design does not match exactly on both sides. Although the seam allowances are uneven on each seam, they will even out over the whole unit. 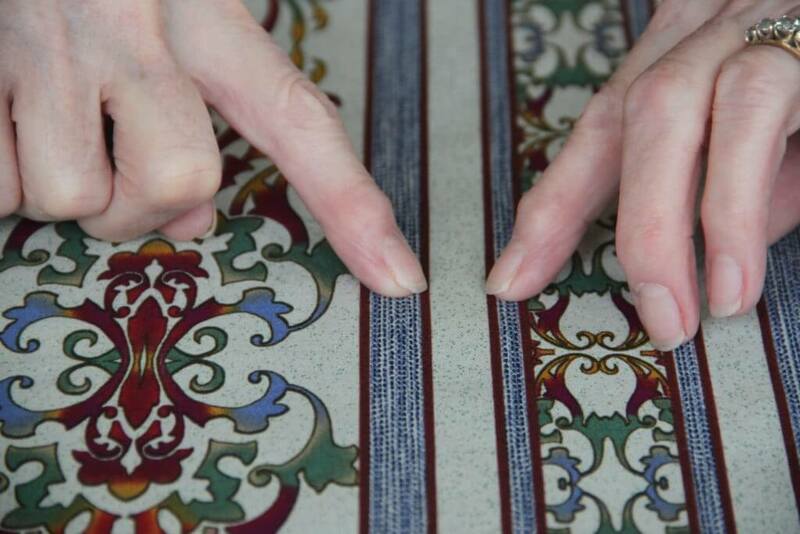 By matching the design and not the fabric edges, you get a perfectly matched unit. Jinny’s border print place mats and table runner are a great project to begin exploring the possibilities of her signature fabric designs. In this video, Jinny gives you an overview of the project and shows you some wonderful examples of what’s possible. Download the free pattern and make up a set of place mats in just a day! All you need is 1/2 yard of border print fabric for each place mat, or 2 yards for a table runner. Browse all of Jinny’s border print fabrics here. Jinny’s border print fabrics are designed by a quilter (Jinny, herself) for quilters. As a result, the fabrics can be used with minimum waste and maximum design possibility. Then be sure to explore this Working with Border Prints tips section to find all the free patterns and instruction on using border print fabrics in your quilts.